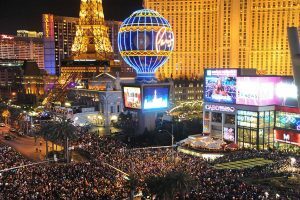 For many Americans, Las Vegas is the IT destination to ring in the New Year. In the city with nicknames like the “City of Lights” and “Glitter Gulch” becomes even more dazzling for New Year’s Eve. At 6 p.m., the world famous Las Vegas Strip will be completely closed to vehicular traffic, thereby creating enough room for an enormous street party with over 300,000 people expected to attend. The highlight of this mega-event is as the clock strikes midnight, when fireworks will be shot simultaneously from the rooftops of seven major Vegas casinos including the MGM Grand Hotel and Casino, Caesars Palace and the Venetian for a breathtaking display of pyrotechnics.